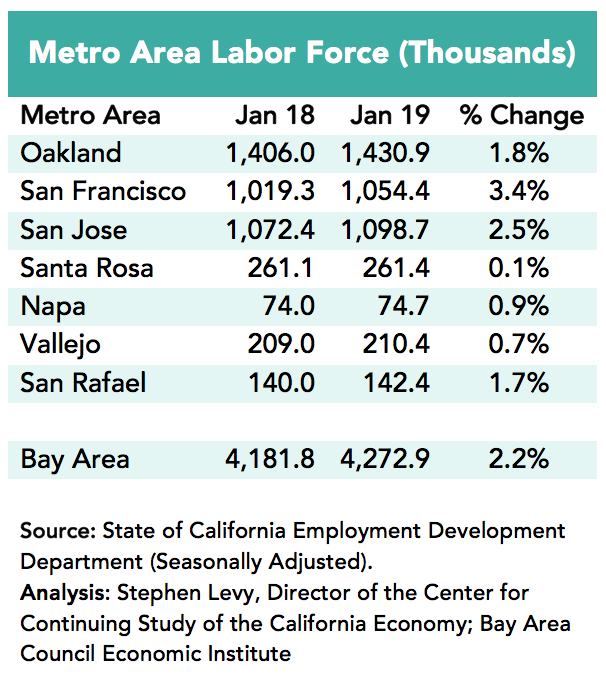 •	Bay Area job growth continued in February led by gains in the San Francisco and San Jose metro areas. •	Strong labor force growth supported the job gains as more residents returned to the workforce and found jobs. •	However, job growth is beginning to slow as it becomes harder to find new workers. Continued growth requires housing, transportation and immigration policies that can attract new workers to the region. Year over year job growth declined to a still strong to 2.1% and the region outpaced the 1.7% growth for the nation and 1.3% state job growth. 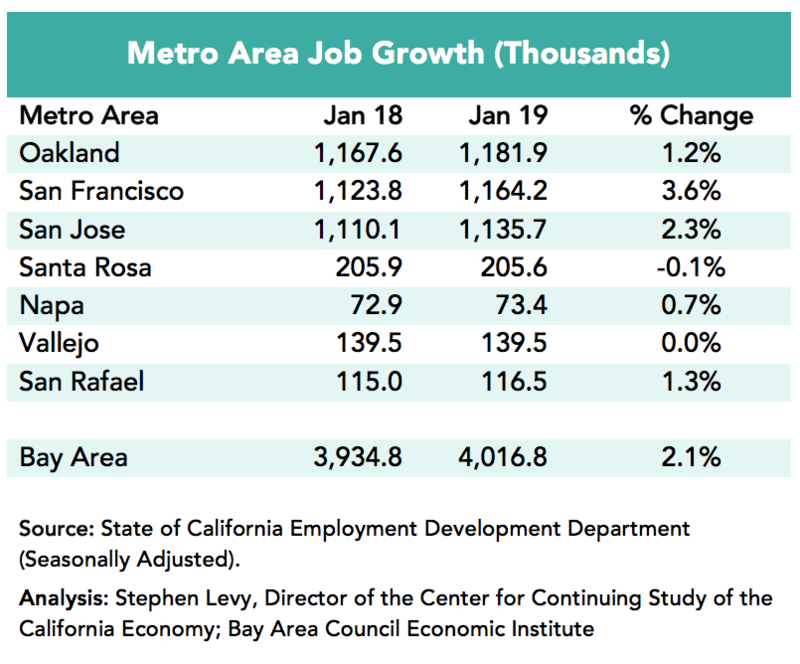 The San Francisco metro area led the region in job growth over the past 12 months followed by the San Jose metro area. 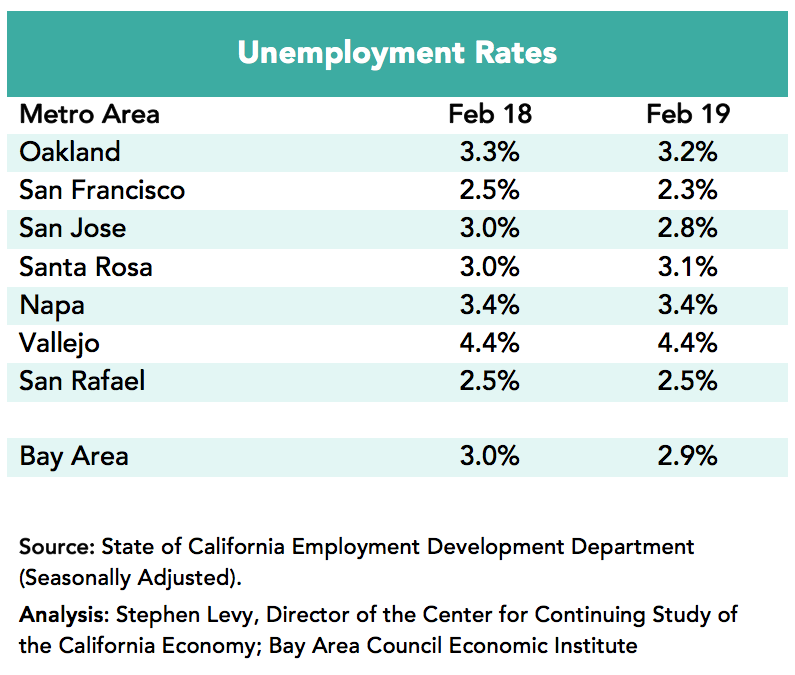 Unemployment rates remained low in February 2019 throughout the region but there are signs that it will be hard to see further declines as the regional unemployment rate is already at a low 2.9%. The labor force growth continued though at a slower pace than in January and is good news for people who left the workforce and can now return. It reflects two trends—1) the strong job growth and need to find workers and 2) the decision by employers to look at potential employees they did not previously consider. 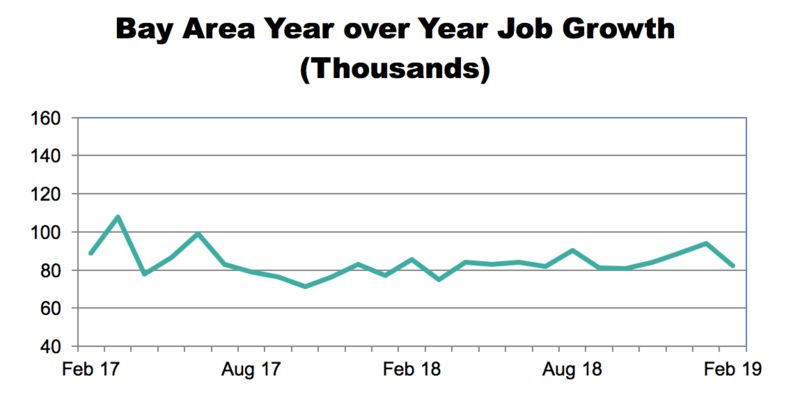 Year over year job growth has remained in a narrow range since early in 2017 supported by existing residents rejoining the workforce. This occurred despite slowing population growth and rising outmigration in the face of high housing costs. Housing permit levels continued an upward trend in 2018 though most of the gains came in the first six months of the year and in Sonoma County, site of the fire damage. Permit levels were up 14% in 2018 and were up strongly in January 2019. So the region will continue to struggle to find new workers as increasingly they will come from people moving to the region, which has become difficult given the housing shortage and high housing costs. The struggle to attract and house new workers will happen as 1 million Bay Area residents retire by 2030. Below is a link to the blog on this topic I wrote for SPUR. The region has reached the point where future labor force growth will need to come mainly from new residents and new housing. Higher levels of labor demand based immigration will be needed and transportation links from adjacent counties including a Central Valley to San Jose link would help. Readers can follow the ongoing local, regional (CASA) and state (SB 50 and other housing bills) efforts as the need for action becomes clearer each week. 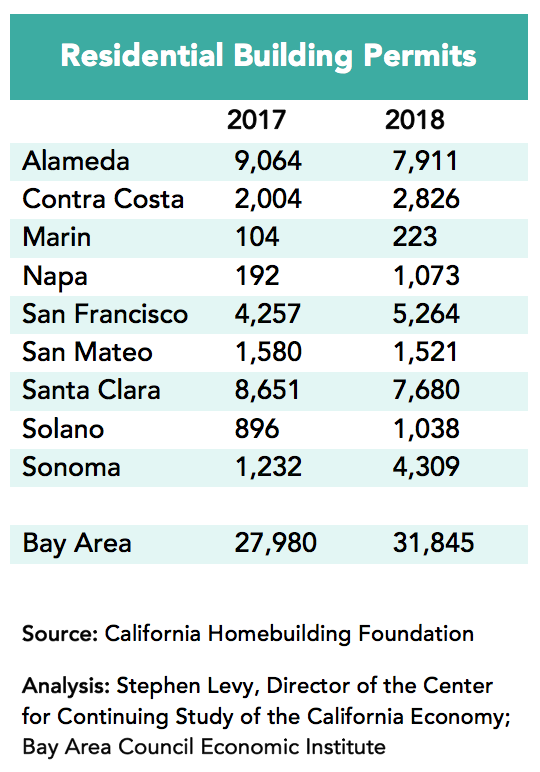 SPUR published an estimate of the regional housing shortage at https://www.spur.org/news/2019-02-21/how-much-housing-should-bay-area-have-built-avoid-current-housing-crisis and has ongoing efforts in this area as does the Bay Area Council.